I didn’t expect to be writing a blog about a festival, as I’ve been to a few in the past and never had a bad word to say. I didn’t actually think I’d have anything at all to comment on in regards to the day. I didn’t expect to encounter any issues. But I was so, so wrong. One of my best friends had kindly bought me a ticket for Mutiny Festival in Chichester, which was so lovely of her. She really wanted to cheer me up and help me forget about everything that’s been going on recently. I really appreciated the gesture and went along with her to the festival yesterday. I’d worn a high neck vest and dungarees and some boots, something I knew would hide my bag should it blow up a little and something I was comfortable in. We’d arrived at the venue and whilst waiting for others to join us, went to the pub. By the time we’d gotten back to line up, the queue was massive. So badly organised too, even the security guards and policemen commented on how poorly arranged it was. 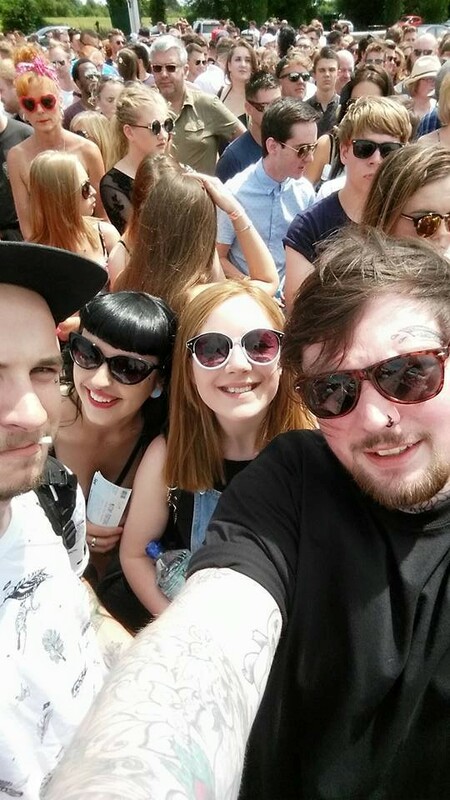 It was baking hot and we were squashed up in a forever expanding queue for two hours. It seems people had completely forgotten their self awareness and respect for others as they pushed in from the sides, groups at a time fighting for the front against those who had been standing patiently for hours. Not fun when you’re trying to protect your stomach from being elbowed by those who are too impatient to line up properly. When we’d finally got in, I was in desperate need of the toilet. The first toilet we approached had already been completely flooded and shut off. I waited and went and watched Snoop Dogg with my friends, (the only reason we’d really wanted to go) and then went to look for some public toilets afterwards. The first set of toilets were a mess. There were no cleaners around for the whole day, and so muddy tissues (I assumed it was mud anyway – but after the amount I saw yesterday, I really can’t be sure) flooded the floor, preventing me getting my stuff out to help sort my ostomy bag out. No toilet roll was supplied once they had run out, and so it seemed I’d taken up a freelance job of handing out my baby wipes to those in need. It was getting to the point where I couldn’t comfortably join in with everyone else because my ostomy bag was the size of a beach ball. My friend and I managed to hunt down what seemed to be the only staff of the event to ask for the use of their toilet. Considering it was taking place at Fontwell Racecourse, we’d assumed there would be inside toilets. I didn’t explain why I needed to use them, just emphasized by desperation. I didn’t feel I needed to explain, and to be quite honest didn’t want to embarrass myself trying to justify my situation. But after they denied the use of a toilet, and I’d walked away, my friend went and explained why I needed to use them so badly. They insisted there weren’t any other toilets than the ones I’d already seen, (hard to believe, what were the “VIP” using?) but a woman kindly took me over to the ONE disabled toilet across the whole festival. I don’t normally use disabled toilets as the others are normally clean enough to use, but this time I had no choice. She took me over but it was already full of others who didn’t want to use the other toilets either. The woman explained I had a medical condition to the girl at the front of the line – who didn’t take the information too kindly – and she reluctantly let me in front of her. Once in these toilets, I noticed the toilet was also nearly full to the brim with toilet roll and used tampons. I nearly vomited it was so disgusting. So instead of emptying the bag like I’d normally do, I had to take all my equipment out onto the baby changing area and completely start from the beginning with a new bag. Of course this took time. And it seemed others had noticed that too, as people vastly began shouting and banging at the door, actually threatening to knock the door down – knowing that I did actually have a medical condition, unlike them. It was absolutely disgusting behaviour. I had to leave the toilet as soon as possible, still doing up my dungarees as I left, but before I knew it, the girl behind me had swung the toilet door into my back. No body had let me pass to get out of the toilet entrance, so I’d had to climb under the barriers to get out. I was wedged in between the door and the barrier, shouting at her to stop, but the door was pushed harder into my back. My friend helped me out but I completely flipped at the girl. Her behaviour was absolutely disgusting, I couldn’t believe it. I desperately needed a drink after that and chilled out with my friend for the rest of the day, watching the acts. But the incident had set off the day on a sour note. By the start of the evening, two public toilet buildings had been shut off and all that was left for hundreds of people were a few portaloos. You may be thinking to yourself “it’s just toilets”. But it’s not. When you have to take time out of what’s meant to be an enjoyable experience to change an ostomy bag that shouldn’t have needed to be because the cleanliness was so poor, alongside a group of people shouting at you for withholding their queuing time with it, it sort of makes you feel like you shouldn’t be there. And perhaps I shouldn’t have, but with the amount of live events I’d been to in the past, I really didn’t anticipate any troubles. I’d never been to anything like this. I watched two underage people overdose on drugs before being taken away by paramedics just two hours into the event. In the heart of Chichester. Seriously? I later found out that as the queues had gotten bigger, they’d stopped checking ID to hurry up the queue. Was this worth it?Rubbish and waste suffocated every aspect of visible ground and in 12 hours not one litter picker had been in sight, and no waste bins were available. Queueing for drinks took anywhere between an hour and a half to two hours. Girls who can’t have been over 16 were begging people for pills. Had it been a midnight rave or worldwide festival, perhaps this was a little more normal, but for a small country town it was just down right embarrassing. I’d never want to be that person that moans about a festival, I love live music, bands, the atmosphere… The acts were great, but it was just overshadowed by the lack of respect people had for the place, and other people. So many people left early, complaining about the state of the site, the respect of some festival goers and the unhelpfulness of the staff. I joined these people and went off the pub. We ended up having a 2 course meal instead. That was no festival, it was literally just an example of everything we should be aiming to repress. I’d definitely recommend anybody with a medical condition that forces you to need the use of cleanliness or disabled toilets not to go, it’s more trouble than it’s worth. The amount of people bigging it up made it sound like Reading, but I can assure you, if Reading was anything like this, it would’ve been shut down a loooong time ago. Or Mutiny Festival perhaps should’ve taken up the offer of help from The Fontwell Racecourse staff. I’d hate to see the look on their faces when they come back to work on Monday morning. I think perhaps if they’re aiming to pull this off next year, after failing miserably this year…. They should probably have a rethink. Oh, and on the left you’ll see a picture of me smiling. And yes, it was taken before we entered the festival. I am embarrassed that this event was so poorly organized. Just outside my local town of Chichester, at Fontwell Racecourse. I am a full time electric wheelchair user so understand the problems associated with mass events and disabled access. I would not insult your integrity by even beginning to say I get just how distressing this must have been for you but I do empathise, wholly. I think you should write to the organisers with a copy of what you have written here, asking for a full refund, you deserve it. I am angered also that ID,s were not checked, I was in a local Waitrose who were having real issues with already intoxicated attendees trying to get more alcohol. It seems to me that not only was Mutiny poorly organised but Chichester itself in terms of policing was also poorly prepared. Ridiculous really, as it’s not as though regular large events don’t take place here, festival of speed an example. I am so sorry you had such a terrible time, I really am. I have followed this blog since you started and admire your tenacity greatly. My son has a friend who has had very similar medical problems as yours). I hope you return to Chichester and have fun fun fun. I’m just sorry your experience was so awful. My ex had a bag fitted, so I can sympathize with your predicament, you have nothing to feel embarrassed about. Wow this has set me back a bit unfortunately. I feel a lot of empathy for you, I had my operation just prior to Christmas and one of my main goals is to be able to go to festivals and gigs. I’m petrified of being in the middle of a favourite act and needing to empty yet the toilets being a train away. I’m starting to get a lot better, back at football and nearly well enough to look for work, so hopefully I can pluck the courage and get to a festival! All the best Sam. hattie,why have u got to change your bag every time u go to the toilet? ps I change mine once a week.